Tomorrow the Preservation Board will consider the partial demolition of a 12 unit apartment building at the corner of Lafayette and 39th Street in the Tiffany Neighborhood National Register Historic District. 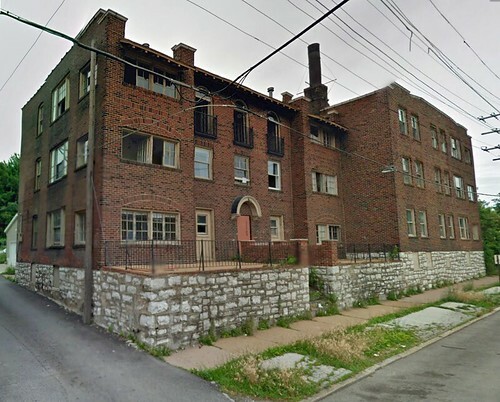 As with so many demolitions in St. Louis, this building is proposed to be knocked down for a surface parking lot. The building at 3867 Lafayette was built with 6 apartments facing Lafayette and 6 facing 39th Street. It is a textbook example of how good urban corner buildings were built to address both streets. The view above is of the portion of the building facing 39th Street which is proposed to be demolished. These views from Google Steetview are not very old, and as you can see, the building while empty appears in decent shape. The windows look to be almost completely intact. Like any building of this age though it likely needs a complete rehab inside. 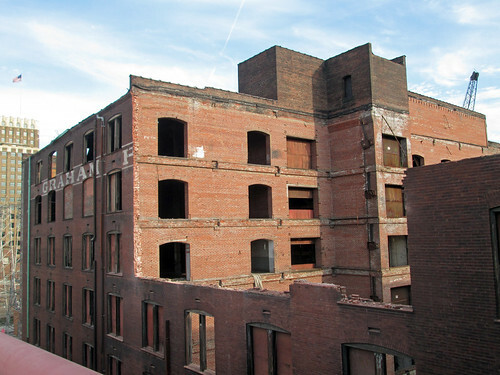 Being located in a National Register Historic District, the a rehab of the building is eligible for Missouri and Federal Historic Rehabilitation Tax Credits. 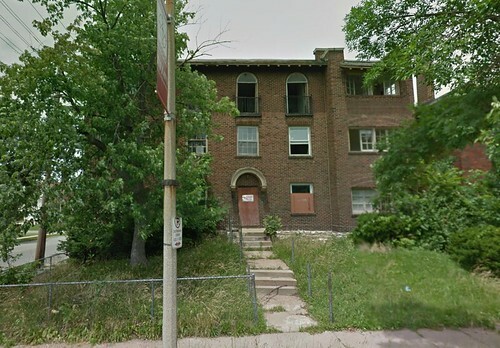 UPDATE: The Preservation Board voted tonight to approve the demolition of the 6 units facing 39th Street. There were 3 yes votes, 2 "reluctant yeses" and 2 no votes. The comparison I made to the Spring Avenue buildings was called non-relevant because Spring is a "nice tree lined street with gates on Lafayette" and 39th is a busy street during nearby hospital shift changes. So basically they said this is a bad site... so lets add off-street parking! Neighbors, the Garden District rep and Alderwoman Marlene Davis argued that this has been a "problem property" for some time and that the "density" was a problem. Interesting how it doesn't seem to be a problem on the other end of the same block. 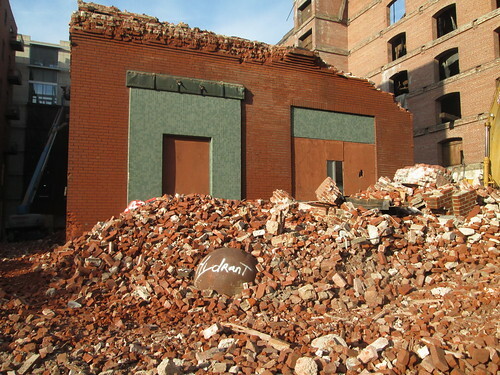 These same arguments, by the way, led to clear-cut demolition of 6 blocks west of 39th 10 years ago (see link below). My argument that unit density could be easily reduced to 8 by combining portions of units was also ignored. In the end, against the wording of the ordinance, the board voted to demolish a sound merit building in a National Register Historic District. This sets a very bad precedent for historic districts across the entire City! The elevation facing Lafayette is identical except for the lack of the raised terraces flanking stair to the entrance. The demolition is being proposed the Garden District Commission, the organization that ten years ago employed 1960's style urban renewal tactics to clear-cut six blocks of historic buildings between 39th Street to Thurman and Lafayette to Folsom. The Garden District Commission does not currently own the property. According to Geo St. Louis it is owned by CXA Corporation of Dallas, TX. The Commission wants to acquire the property, demolish the 6 apartments facing 39th Street and build the parking lot, then sell the building to a developer who would rehab the remaining portion of the building. The Garden District Commission argues that the demolition is required in order to serve the remaining 6 apartments with off-street parking. The Commission is also playing a shell game with Historic Tax Credit rules. 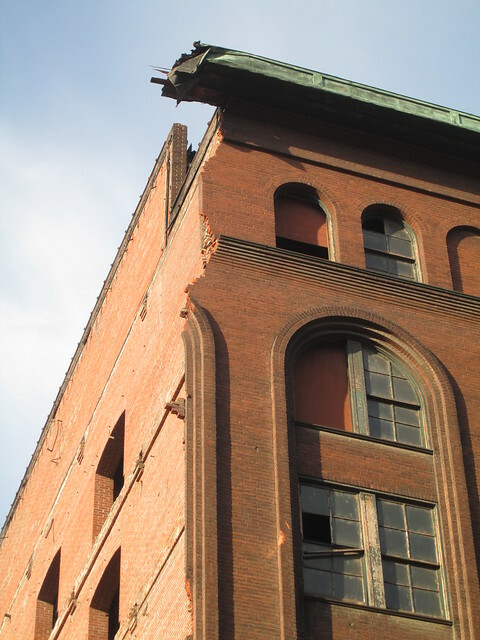 If a developer bought the building and tried to demolish half of it, they would very likely find themselves being denied Historic Tax Credits for the remaining portion of the building. But if the Commission demolishes the wing facing 39th Street and sells the the property, the tax credit reviewers would not be able to punish the developer of the remaining building because it is a different owner. 39th Street at left in the aerial view above was the demarkation between the clear ant re-build development and the remaining neighborhood. 3867 Lafayette sits at the west end of a remarkably intact block and one needs to look no further than the other end of the block to debunk the Garden District Commission's argument for demolition. On Spring Avenue between Lafayette and McRee there are no less than three 12-unit buildings of the exact type in question at the other end of the block, and none of them have any off-street parking. The buildings are all occupied and appear to be well maintained. 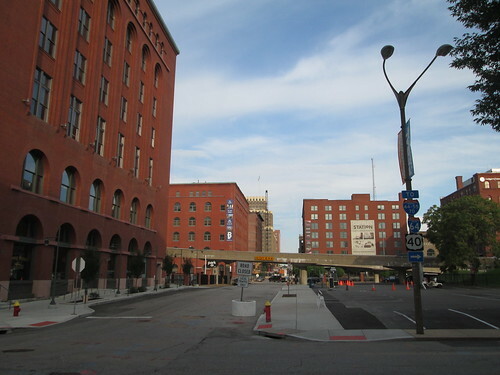 A view north on Spring Avenue from Lafayette. Other than architectural style, these are the exact same building typology with 6 apartments facing the main streets of Lafayette and McRee and 6 facing Spring. Toward the middle of the block the buildings form a very attractive urban landscape. Just think how different this would look with three surface parking lots replacing the wings of the buildings that face Spring. Back on 39th Street, the Preservation Board should deny the proposed partial demolition of this historic building. It is clear that buildings on Spring and from a quick survey of many buildings in the nearby Shaw neighborhood that off-street parking is not required for a building to attract residents. 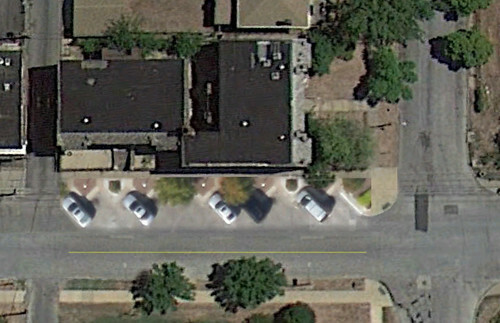 If dedicated parking is desired, it could easily be attained by creating angled parking along 39th Street in front of the building. The traffic lanes would shift to the west side of the street where street parking is not needed along the side of the suburban style single family home. 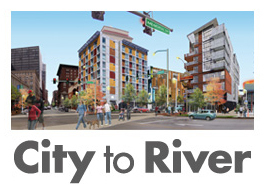 Between Lafayette and the mid-block alley about 10 spaces could be created. 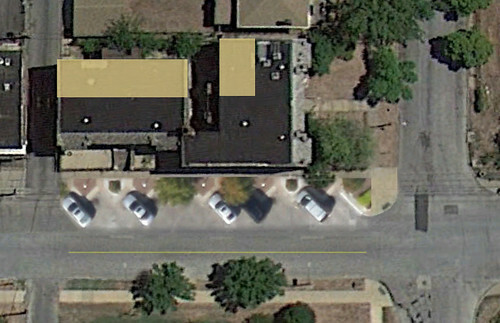 With additional parallel spaces on Lafayette, a similar parking ratio as being proposed with the demolition could be achieved. 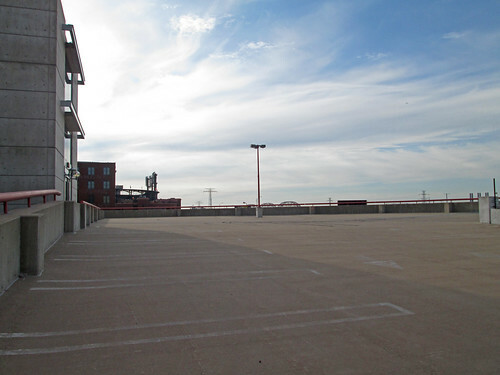 The south side of Lafayette that abuts the highway provides ample overflow parking. 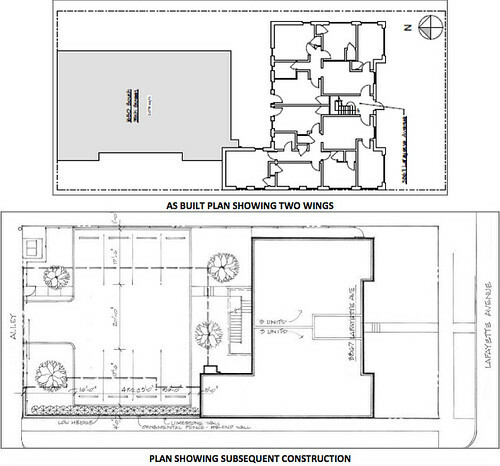 To improve the parking ratio immediately adjacent to the building, the developer could take down the rear portions of the 2nd & 3rd floors of the north wing and half the south wing and create three 2-story townhouse units, reducing the overall unit count to 9. Because the selective removals would be at the rear of the original apartments and not visible from either street, this could likely be approved by the tax credit reviewers. 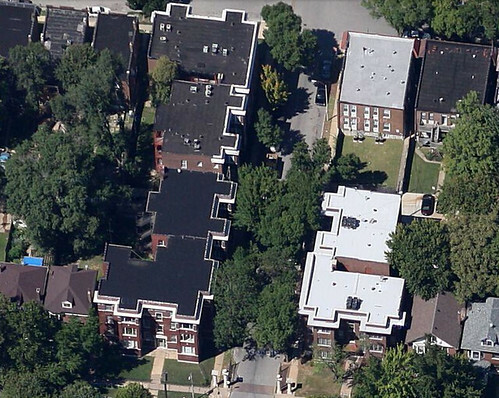 The townhouse units could end up with very desirable roof decks in this plan. Another option to reduce the unit count would be to simply combine portions of the units, which are mostly under 1,000 s.f. 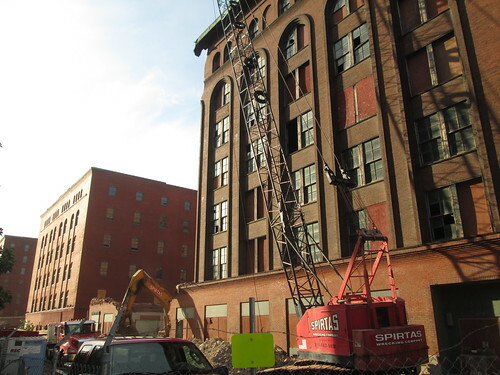 Although I pass within 400 feet of Cupples 7 at least 10 times a week to and from my daily destination of the 8th & Pine station, I had managed to stay away since the City turned down the final effort by Vertical Realty to save the building and it was announced that demolition would begin. Out of site-out of mind. Finally though after seeing a few photos posted online curiosity got the best of me and I figured I should go photograph the carnage in progress. Approaching from the Stadium Station at 8th & Spruce, once the epicenter of the Cupples complex and home to its most massive warehouse (rivaling the Butler Brothers warehouse in size), you pass through a uneasy checkerboard landscape that alternates between restored warehouses and asphalt parking lots with a few highway ramps thrown in for good measure. I was surprised to see that almost half the building is gone. A portion the Spruce Street elevation was removed and the interior structure ripped out and knocked down. A resident in the Cupples Station Loft Apartments across the street shot a video of this process and posted it on Youtube on August 1st. Now the exterior walls are slowly being taken down. When I visited on Thursday morning, some remaining interior timbers were being loaded onto a flatbed truck. 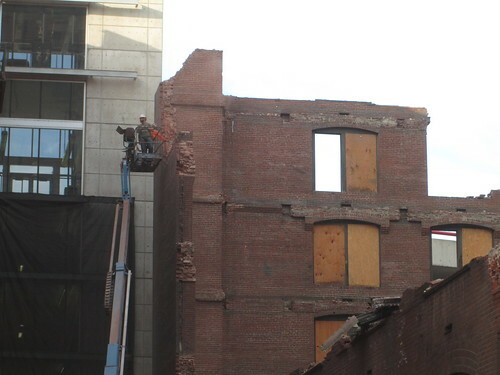 From the 11th Street corner you can see the stark effect of the removal of the east half of the building on what was recently a fully intact block face. 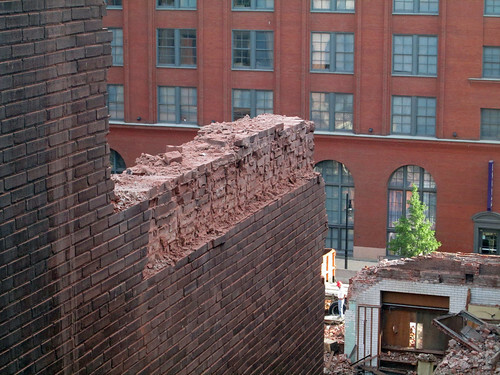 Spruce Street in front of the site is piled high with brick debris. A pair of men on a lift were chiseling apart the east wall brick by brick, which I would have assumed are being salvaged, but I'm not positive of this with the debris piles around the site. Much of the rear wall remains as viewed from the parking garage behind Cupples 7 and its neighbor, the renovated Cupples 8. With its full height masonry dividing wall and the opposing elevator shafts made the center of the building quite stable despite the loss of much of the roof and interior structure. 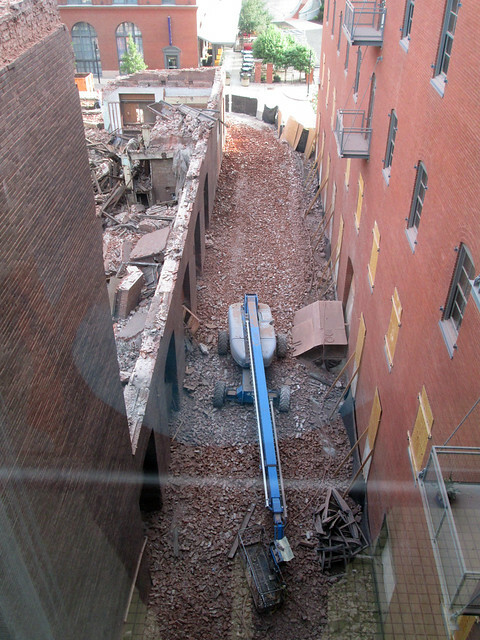 The former alley between the two buildings is also littered with brick debris. A close of of the slow process of taking down the massive exterior walls, which are 5 wythes thick at the top and grow thicker by a wythe every few floors going down. 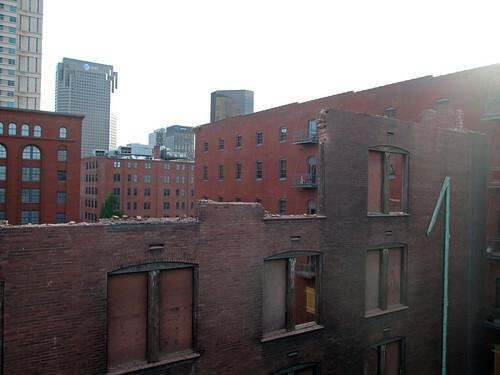 Once Cupples 7 is gone, the Cupples garage will have quite a view. 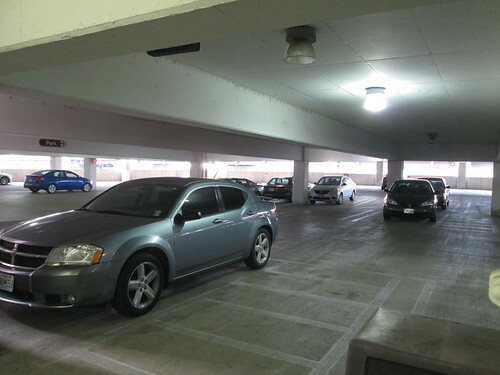 At 8:15 am on a weekday morning levels seven through four were completely empty except one car on four. 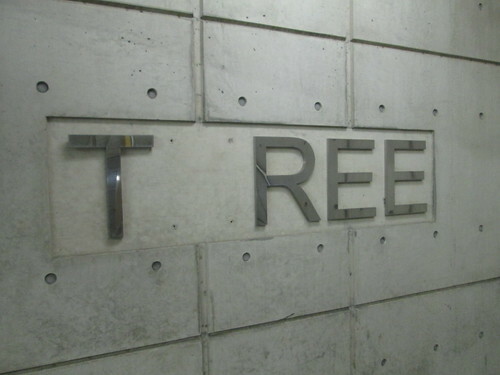 Level "T REE" (all the floor signs have been vandalized or stolen) had a few cars and it seemed like some people were still trickling in, but overall the garage operates far under capacity. 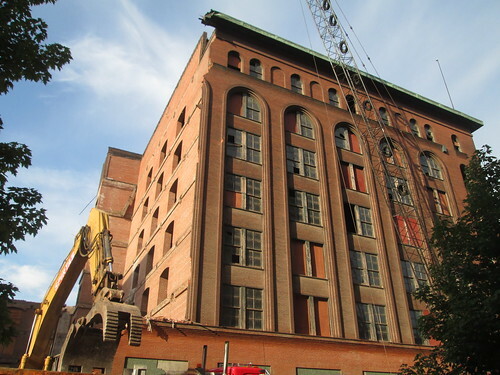 Once Cupples 7 is gone, the site will probably sit empty for quite some time as the building that is being destroyed was far more desirable than the site itself. Hopefully I will be proven wrong. As we have seen with phase one of "Carpark Village", demand is not yet present for new large scale office or residential construction, and new structures are likely to go up first on more high profile sites at the "Village". 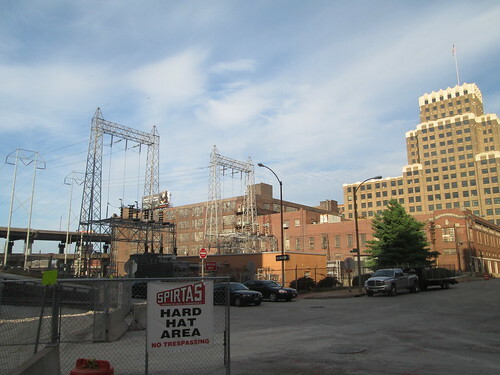 While the Cupples Station Loft Apartments are very attractive across the street, the view west of the Cupples 7 site is challenged by the 11th Street off ramp and a large Ameren sub-station. 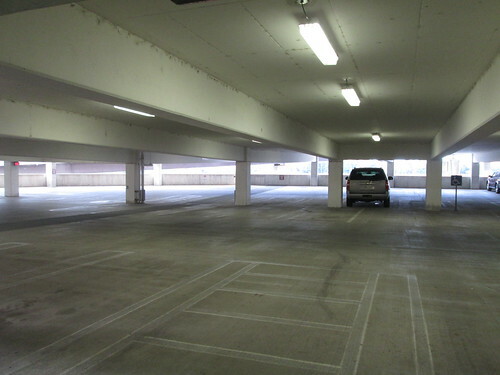 One thing it does have going for though: parking capacity. 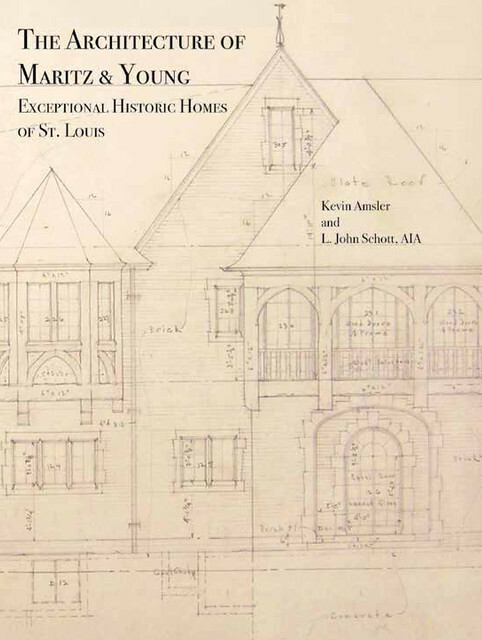 This Wednesday evening at 7 pm the Missouri History Museum at Lindell & DeBaliviere will host a lecture and book signing featuring the authors of a new momograph about the architectural firm of Maritz & Young and the historic homes they designed. 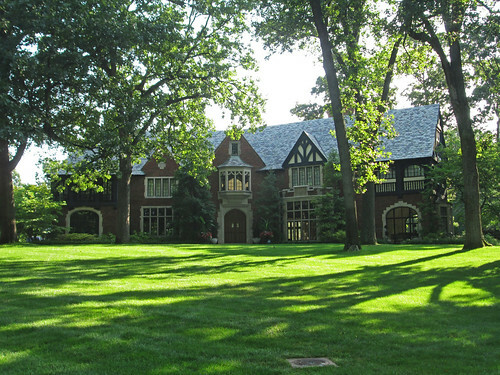 If you are familiar with Lindell Boulevard west of Union, Forsyth across from Washington U. or Brentmoor Park and Carrswold Drive off Wydown, you will recognize the beautiful works of architects Raymond E. Maritz and W. Ridgely Young that were constructed between 1915 and the beginning of WWII. 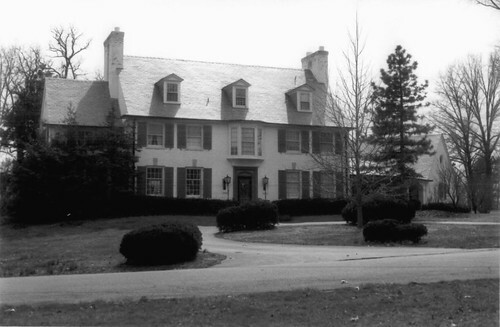 The homes were built for St. Louis' most prominent citizens of the day in styles ranging from Tudor and Norman Revival as well as Georgian and Mediterranean Revival. The new book by Kevin Amsler and John L. Schott, AIA (who was a project architect with Ramond E. Maritz & Sons for 30 years!) 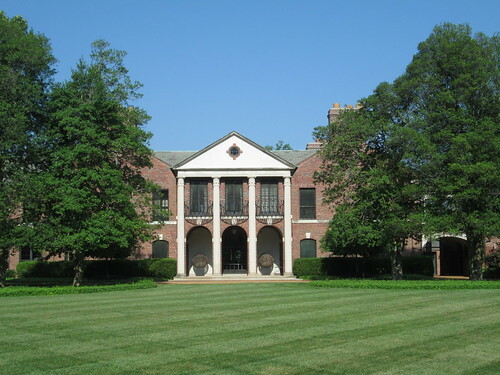 is packed with over 200 mostly period photographs, floor plans, elevations and other architectural drawings as well as detailed descriptions of the residences and original owners. There is also a list of the firms works. Looking at the caliber of these grand homes, you would never think that someone would view them as tear-downs, but that is exactly what happened at 37 Brentmoor Park. 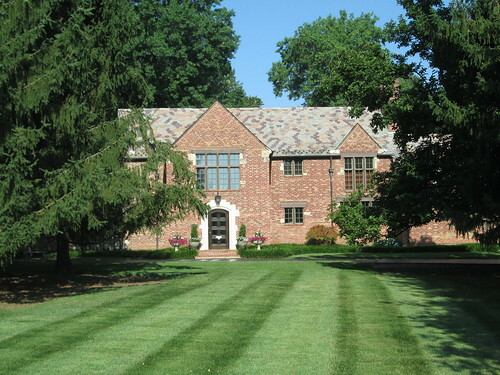 This center hall Georgian style home was constructed in 1925 for Kenneth Davis, president of a local real estate company. The home five bedroom home had an iron balcony stretching across the entire garden elevation at the second floor with french doors opening into each room. On the first floor a 3-car garage was attached to the house by an arc shaped wing containing a breakfast room, large pantry and a gallery porch facing the street. Photo above from the Brentmoor Park National Register nomination. 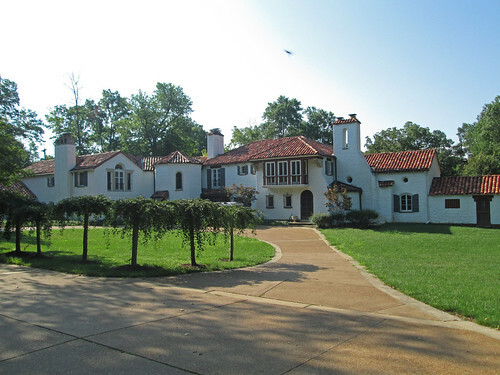 The St. Louis County property records list a "land only" sale for $1,250,000 in 2003, and in 2006 or 2007 (county lists 2 different dates), this sprawling somewhat modernized version of a Mediterranean style house was built where the Davis house had been demolished. Had the owner of the new home above been patient, they could have purchased an authentic Mediterranean style house designed by Maritz & Young on a larger lot with a pool at 16 Brentmoor, which was on the market in 2007. While they probably didn't need it, the buyers could have received Missouri Historic Tax Credits for a renovation of the home. 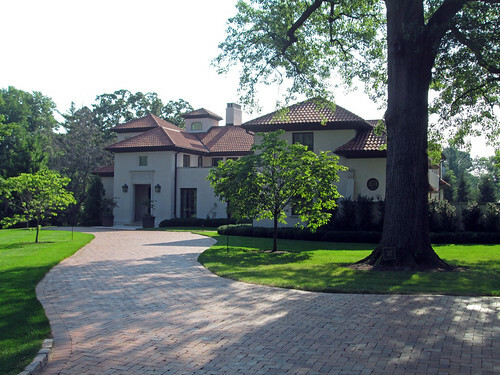 Of 41 homes, Brentmoor Park features 9 remaining homes by Maritz & Young. 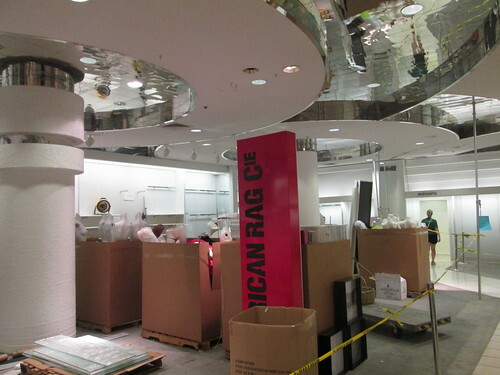 According to a sales associate when I was making some purchases at the clearance sale recently, the last day of Macy's Downtown St. Louis store will be tomorrow. The date will mark the end of 100 years of existence of the department store on the lower floors of the 21 story Railway Exchange Building, which opened in late summer of 1913. 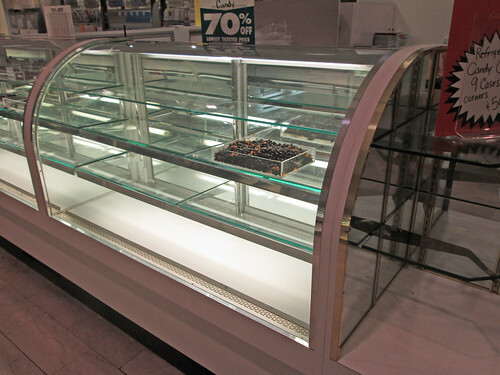 With the announcement in May of the store closing and the beginning of the clearance sale on June 1st, by the 3rd week of July, the once grand store was looking very bare. Most merchandise had been consolidated on the first floor. The fragrance and cosmetics counters were now stacked with varying arrays of housewares, pots and pans, small appliances and various misc. merchandise. Even the candy counter near the Olive Street entrance was stripped down to a few trays of jelly beans Frango mints and odds & ends. 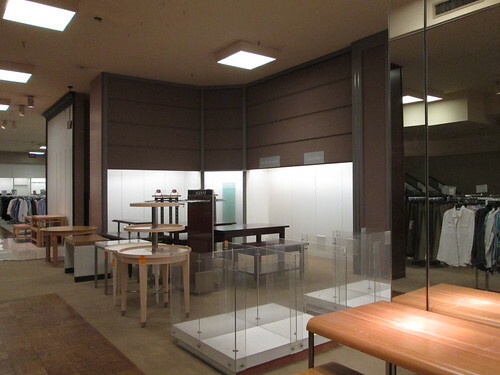 On the second floor, beyond the small area of remaining menswear and shoes were rows of various store fixtures and furnishings for sale. Included in the sale are all the oak tables and chairs from the former Fabar's restaurant at fairly inexpensive prices. More fixtures and furnishings for sale. 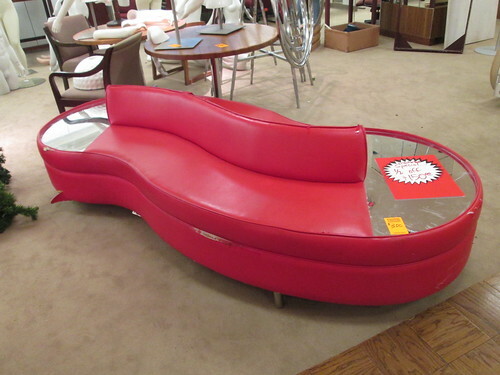 This double sided curvy and somewhat tattered settee can be yours for $150. 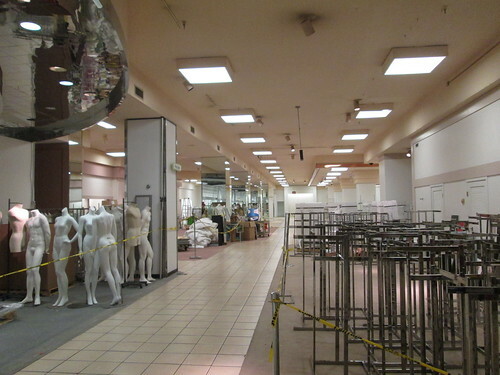 On the third floor of the store there was no merchandise left and the sales floors were cordoned off into various sections of giant boxes of mannequins, holiday decorations and assorted store fixtures that were not for sale. The decor of the west quarter of the third floor feels like a time warp back to 1985. While this area was most obvious, it does not take a trained eye to see that there had been little investment in the Downtown store for decades other than a coat of paint, carpeting and the installation of new escalators between the first and third floors in 2003 when the store was still a Famous Barr owned by the May Company. 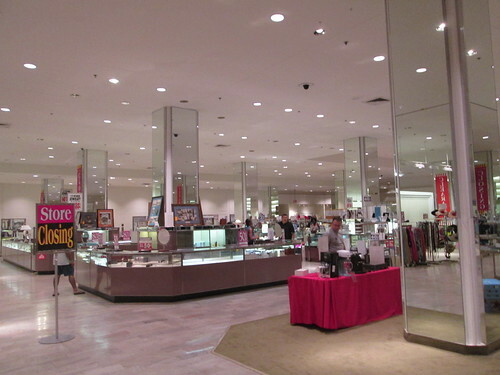 The last major remodel and freshening of finishes (other than consolidation of the store to three floors in 2011) had been prior to the opening of the St. Louis Centre mall in 1985. One has to wonder how much influence the stale appearance of the store had on retail sales. 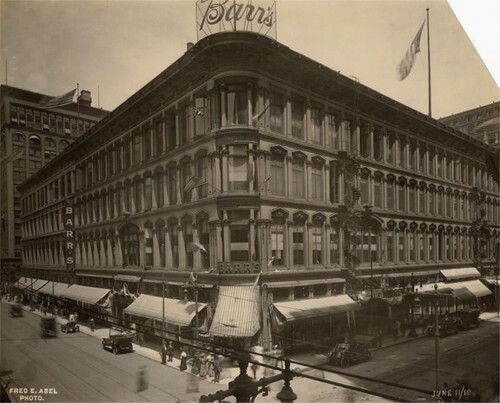 The east half of the block bound by Olive, Locust, 6th and 7th Streets had been the site where William Barr, had built a new four story building for an expansion of his William Barr Dry Goods Company in 1880. This building was expanded to cover the entire block which became known as the Barr block. Photo circa 1910 from the University City Public Library collection. Facing tough competition from the Grand Leader (Stix Baer & Fuller), which had opened a brand new 8-story building at 6th and Washington in 1906, and the May Company's Famous Clothing Company, Barr's owner decided to replace the outdated 4-story block with a new building that would house the enlarged department store and railway company executive offices above. In 1911, Barr's merged with the Famous Clothing Company to form the Famous & Barr Company and it was decided that the May Company headquarters would be housed in the new building as well. 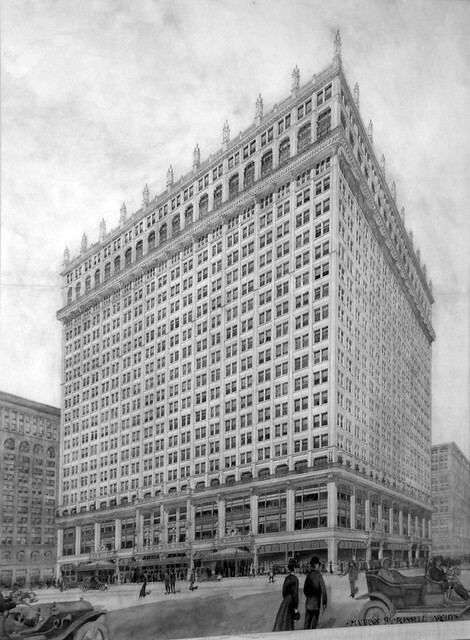 Original rendering of the Railway Exchange Building from the National Register nomination. While the loss of Downtown St. Louis' last department store is somewhat sad, it had been a long time coming. 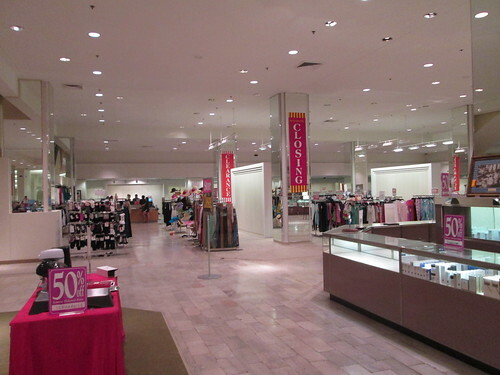 Realistically the store had not seen foot traffic needed for sustained viability since the early to mid 1990's, when St. Louis Centre as a whole lost traffic to newer suburban competition, mainly the expansion of the Galleria which opened in 1992 (resulting in the closure of downtown Clayton's last department store). 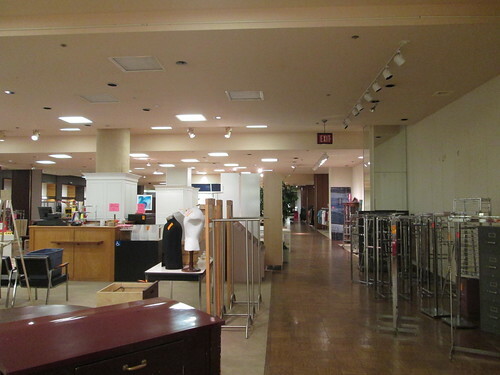 After the Centre was already on life support, Dillards closed the Washington Avenue store in 2001, which had already been converted to a clearance center. Even after Macy's closed the midwest branch offices in the Railway Exchange Building above the store, they gave the store one final attempt (even if it was half-hearted) to survive. One of the problems with department stores may very well be that they have been around for too long. The traditional department store is still largely stuck in well into the last century. They have responded to the onslaught of the category killers, the Targets, to powerful brands like the Gap, Banana Republic, The Limited, Victoria's Secret, etc. sucking market share away, to urban lifestyle center, outlet centers and the slow death spiral of the traditional mall simply by consolidating, offering fewer product types, shrinking and closing stores in a triage like manner, but not significantly changing the overall store model or sales philosophy. 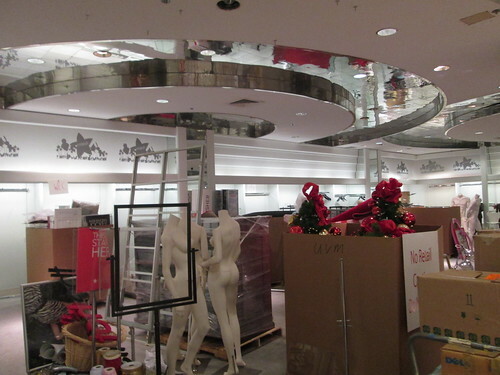 This year Macy's is also closing stores in Downtown Houston, St. Paul and Honolulu. The reality is that we are not so much losing a great department store as much as we are losing a dinosaur.